Forget crystal meth. The pseudo-religious Knights Templar drug cartel in western Mexico has diversified to the point that drug trafficking doesn't even rank among its top sources of income. 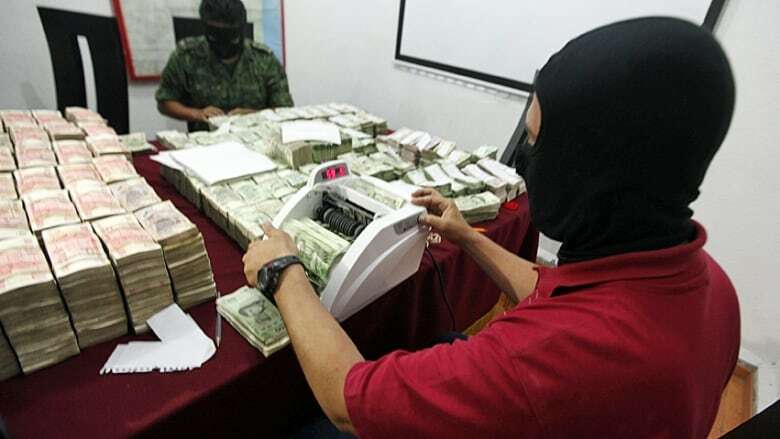 The cartel counts illegal mining, logging and extortion as its biggest moneymakers, said Alfredo Castillo, the Mexican government's special envoy sent to restore the rule of law in Michoacan, the state controlled by the Knights Templar the last several years. Iron ore "is their principle source of income," Castillo told The Associated Press. "They're charging $15 [a metric ton] for the process, from extraction to transport, processing, storage, permits and finally export." The ore itself doesn't go for that price; the cartel skims $15 for every ton arriving in port. While it's long been known that Mexican cartels engage in other types of criminal activity, including trafficking of people and pirated goods, this is the government's first official acknowledgement that a major organized crime group has moved beyond drugs. The Knights Templar and its predecessor, La Familia, started out as major producers and transporters of methamphetamine. The implications are enormous that organized crime in general in Mexico stands to diversify and become even more entrenched. "It's a criminal organization like the mafia," said Antonio Mazzitelli, the Mexico and Central America representative to the U.N. Office on Drugs and Crime. "La Familia, the Knights Templar and, in part, the new, smaller cartels that have developed, like the New Generation Jalisco, are copying this new typology." Mexican authorities count at least 12 major cartels, but also talk of an untold numbers of smaller splinter groups. Federal prosecutors have not seen similar shifts in other cartels, according to an Attorney General's Office official, who insisted on speaking anonymously because he wasn't authorized to speak about the topic. But experts disagreed. The Zetas cartel, with its strongholds along the U.S.-Mexico border, was among the first to change the business model from merely production and transport of drugs to migrant smuggling and controlling territory through terror. Though drugs still top their list, the Zetas likely make as much from kidnapping and extortion, said Samuel Logan, director of Southern Pulse security consulting firm. "I've never looked at them as drug-trafficking organizations," Logan said of Mexico's cartels. "They're multinational corporations that will react to market pressures and do what they have to do to stay in business." The Knights Templar took the model to another level, exploiting the main industries of the territory they control. Alonso Ancira, president of the National Chamber of the Iron and Steel, recently told local journalists that he estimated drug cartels earned $1 billion in profits from selling iron ore in 2013. It was unclear if Ancira was referring only to the illegal mining done by the Knights Templar, and he didn't respond to an interview request from the AP. The federal government has issued 900 concessions in Michoacan to mine iron ore, Castillo said. In 2008, only 1.5 percent of the iron ore exports to China went through the state's port of Lazaro Cardenas, but by 2012 nearly half of the exports to the Asian country were processed there. As for extortion, Castillo said, information from victims led government experts to estimate that the cartel earned $800,000 to $1.4 million a week just from that crime. Much of its extortion demands were made on Michoacan's lime and avocado producers, and the Knights Templar even controlled the wholesale distribution centre where prices were set and growers sell limes to the rest of the world. Former President Felipe Calderon warned against such a stranglehold when he first sent troops to Michoacan in late 2006 to fight La Familia, the predecessor of the Knights Templar. He said the cartel was trying to infiltrate all levels of society. By the time La Familia morphed into the Knights Templar in 2010, it seemed to control the entire state, including politicians and police who failed to act. More than seven years of military-style strikes failed to dislodge them. Now the federal government seems to be having more success by going after the cartel's financial resources. It took over the port of Lazaro Cardenas in November and named Castillo in January as a commissioner with special powers to try to clean up Michoacan. Since then, authorities have seized 119,000 metric tons of iron ore stored at several yards in Lazaro Cardenas and say they have liberated the wholesale lime centre by taking over the farming hub of Apatzingan. The government also has arrested or killed much of the cartel's leadership, but they did the same to La Familia, only to see that cartel remake itself into something even more menacing. Because of financial hits, the cartel is now struggling to pay informants and assassins, Castillo said, though he didn't explain how that's known. The Knights Templar hold was so tight that vigilante groups eventually formed and armed themselves to fight back. With fighting escalating between the cartel and the "self-defense" groups, federal security forces finally moved in early this year. "The Zetas, La Familia Michoacan, the Knights Templar are, for the most part, predators and parasites that become rejected by the communities," the U.N.'s Mazzitelli said. That contrasts with traditional drug-trafficking cartels, which generate jobs and wealth for local people, buying loyalty and protection. The classic example is the Sinaloa cartel, the only pure drug-trafficking organization left in Mexico, even with the recent capture of its leader, Joaquin "El Chapo" Guzman. Hundreds of local residents protested his arrest.